“The song is about loving someone so deeply that you fall into it completely and surrender yourself to it,” Chin comments. Tessanne Chin's latest single, “Love Suicide,” is a sweeping, soulful ballad of reckless affection. The single captures the essence of finding love so powerful that it is all together consuming and exhilarating. “Love Suicide,” released on her own imprint Chinita Entertainment, is now available on iTunes for pre-sale. Known for her powerhouse vocals and striking range, Tessanne Chin is in the studio working on her third album. She cultivates elements of Soul, Pop, and R&B, but always with a little island flare that sets her apart from her peers. These features in Chin’s music are realized to their fullest potential in her latest single, “Love Suicide.” Her astounding voice illuminates the track as the tension builds throughout this elegant song of absolute true love. Opening with a classic piano melody, “Love Suicide” maintains a fresh and unique style of contemporary and classic R&B influences. Seasoned songwriter, Blu June, whose credits include Rihanna, Mariah Carey, Ariana Grande and many more, brought her skills to assist in writing “Love Suicide.” As Chin exclaims, “Oh baby, I wanna dive right into you, it’s a love suicide,” her strong and gorgeous vocals instantly seize heartstrings, characterizing the sensation of love so strong that catches her off guard. “The song is about loving someone so deeply that you fall into it completely and surrender yourself to it,” Chin comments. As the track builds, the passion in her dynamic belting increases and emphasizes the sincerity of her unquestionable yearning and the hold it has over her. To make the sound come to fruition, Tessanne collaborated with producer Darwin Quinn (Lil’C), whose tracks have charted #1 on Billboard and recent credits include Tyga, TI, Young Jeezy and many more. International Reggae Pop sensation, Shaggy suggested she audition for Season 5 of NBC’s hit singing competition show, The Voice, which she won. She performed duets with superstars, like Celine Dion and Adam Levine, her show coach. Her cover of “Bridge Over Troubled Water” went to #1 on iTunes Overall Top Songs, the first instance of this happening for a contestant of The Voice. Since winning The Voice, Tessanne opened Blow by Blow, a full-service salon in Kingston, Jamaica in tandem with her two sisters. She also recently partnered with Bellami Hair Extensions. 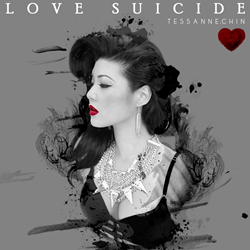 Showcasing Tessanne Chin’s rare sound and style, “Love Suicide” proves yet again that we can expect more aural beauty from the esteemed artist. Having topped the charts in the Caribbean, Chin has recently set her sights on a broader fan base and continues to win over hearts, minds, and ears with her magnificent voice. To learn more about upcoming releases and tours, visit OfficialTessanneChin.com.